Zoo Jihlava invites you for the 7. meeting of travellers, photographers, zoologists and Africa lovers. Except lectures on Saturday in Centre PodpoVRCH and in a clubroom of the zoo there will be a rich accompanying programme. On Friday 7.9. from 18.00 in the Centre PodpoCRCH there will be shown a film Under Sun Darkness, the winner of 15th International Festival of Documentary Films in Jihlava, entrance without registration and free. On Saturday 8.9 in African village Matongo from 18.30 stylish clothes and at 20.00 theatre Cylinder performs Fire on the Mounatin – 5 Ethiopian fables. 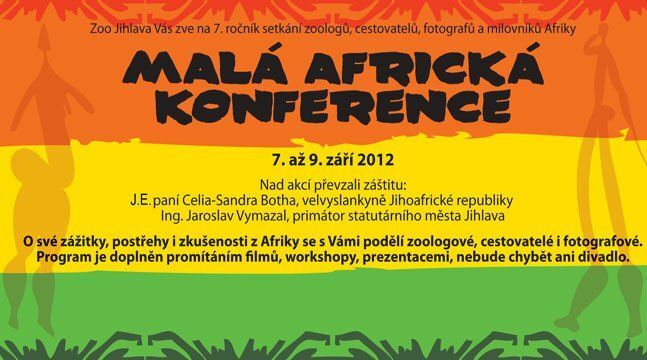 On Sunday 9.9. in the zoo there will be held presentations of African culture, interesting projects and shown films. There will be introduced for example Centre Narovinu, NaZemi, ShineBean, Arcidiecézní charita Praha, Life Africa, culture of Tuaregs, dancing performance Shela and Al Fayyum dancers, dancing workshop of Monika Rebcová and you can watch films Okuhepa Africa, Africa obscura, Bama and lost gorillas and Under Sun Darkness.